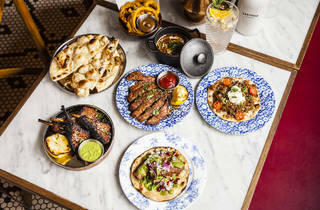 Tandoor-smoked small plates in Covent Garden. There’s so much to love about TCH, I don’t really know where to start. So let’s kick off with the food. 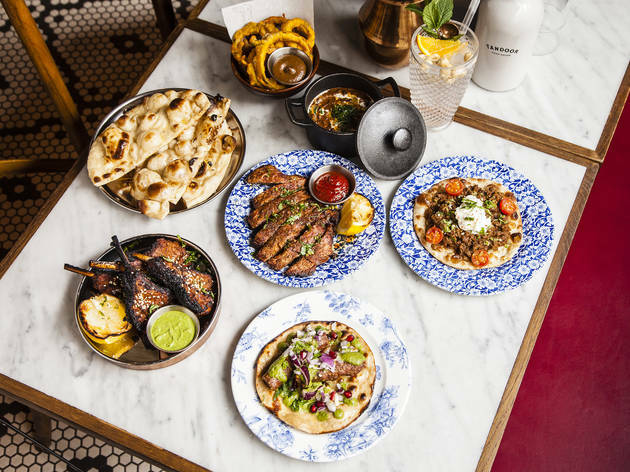 It’s basically a twist on what you’d get in an old-fashioned Brit ‘chop house’, only using Indo-Punjabi spices and swapping the grill for the tandoor. It’s meaty, fiery and smoky. Plates are small. Well of course they are. Then there’s the vibe. Picture a turn-of-the-century Irani café in bustling Bombay: all dark wood panelling, monochrome floor tiles and old photos on the walls. Nagging feeling you’ve seen this before? You’re right. 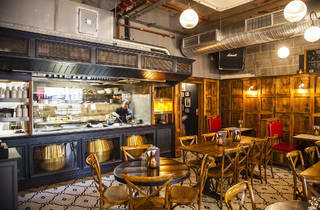 It’s like a slightly less hectic, more refined mini-me of the original (St Martin’s Lane) branch of Dishoom. Is it derivative? Probably. Is that a reason to get sniffy about it? Absolutely not. Especially when they’re playing Minnie Riperton. But back to the menu. I’ll start at the end, with a glittering prize of a pud: the malted kulfi. Dense as a brick, yet silky and smooth, this Indian ice cream had an intense flavour, like sucking the inside of a Malteser after you’ve nibbled off all the chocolate. It’s delicious on its own, but then there’s more. Chunks of caramelised banana – sweet, yielding – sit fatly on top. Finally: fragments of salted peanuts, for contrast and crunch. It was sinful. Indecent. I swooned. Before all this, a couple of charcoal-blistered little naans had competed for my affections. The first, a pistachio-studded seekh kebab, came strewn with zingy bits of red onion, green chutney, pomegranate seeds and fresh coriander. Just roll and bite. Then wait for the hit. But my heart, in the end, was lost to the ‘beef dripping’ keema naan: a molehill of warmly spiced meat finished with a dollop of cooling yoghurt. At a fiver each, these ‘snacks’ are brilliant value. But don’t stop there. You’ll kick yourself if you don’t try the thickly marinated, fatty-edged lamb chops, all soot and spice. Or the juicy, spice-rubbed rib-eye. My advice? Come with several mates and order pretty much everything. 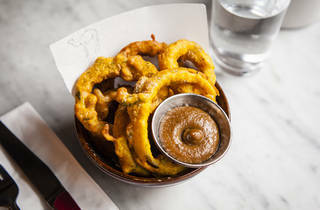 I say pretty much: the bhaji onion rings and gunpowder fries were so-so, while ‘green masala’ pollock was soggy. We never sent it back, but our waiter was so distraught when he heard we hadn’t enjoyed it, he insisted on stripping it from the bill. Which brings to me my favourite thing about TCH: the service. There were just two people working the floor and they couldn’t have been more cheery, more attentive, or more passionate about the cooking. They brought dishes in clusters, then offered us a little ‘break’ before the next set (why don’t more places do this?). Plates were refreshed, tap water refilled, jokes cracked. ‘Have a good day,’ they sang out as we left. ‘Come again!’. Thanks. Don’t mind if I do. After walking past this restaurant a thousand times, I thought it was about time I tried it. I’m so upset that it took me this long as I absolutely loved it (rarely give things 5 stars). Everything we ate was delicious with the right amount of spice. The chutneys were amazing and the naans were soft and crispy at the same time. It’s now one of my favourite Indian restaurant in London and definitely worth a visit. Every now and then in the heart of London, something happens that's surprising and rather special; someone opens a restaurant in the sort of area you normally power-walk through to get to somewhere better…only this time Tandoor Chop House is the something better. Actually, it's something a lot better and if Indian food in the capital to you doesn’t mean thickly clotted sauces, slice-able bricks of boiled white rice or poppadums that leave an oil slick in their wake, then it may just be what you're after. Half height curtains give the place all the unexpected feels of a traditional French bistro from the outside but the grey & polished gold paintwork mark this Adelaide St hideaway firmly in the camp of understated modernity. Inside, wood panelled walls and tiled floors complement a glass fronted kitchen where chefs can be seen working oversized tandoor ovens while red leather booths for two are pitch-perfect for cosy evening dates. I firmly salute anywhere with the assured confidence to present a single page menu and this place nails that with nary a dud in sight on our overloaded table. 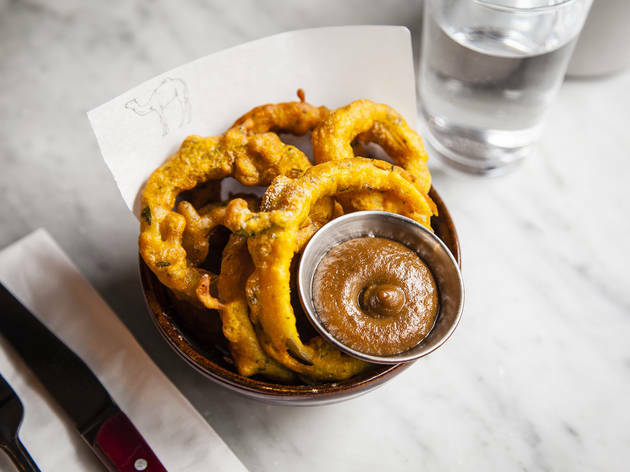 Bhaji onion rings are gloriously golden brown moon craters. Flawlessly cooked, light without oiliness and spiced beautifully they are, hands down, one of the best dishes on offer while a fat, juicy, fragrant seekh kebab roll comes dappled with green chutney and dotted with pomegranate seeds & red onion. Masala rubbed ribeye comes splayed alongside wedges of roasted lemon. Charred and tenderly sliced into baby strips that fall apart in the mouth, it's especially good paired with the accompanying curry leaf béarnaise whilst crispy lamb chops arrive smoky, spicy and warranting the sort of Neanderthal bone gnawing that destroys a tree of paper napkins in the process. 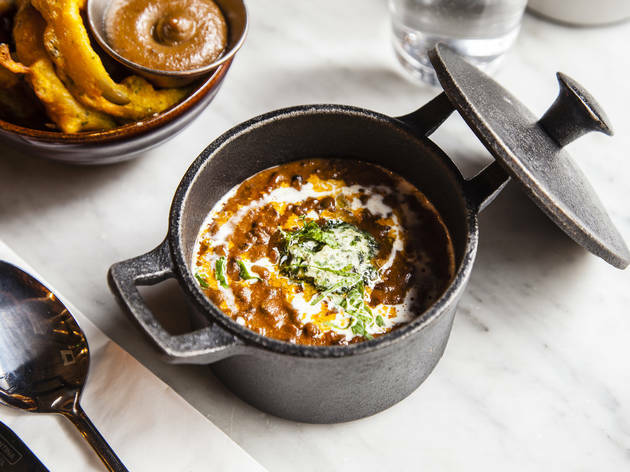 A generous bowlful of Jenga gunpowder fries are gorgeously dry, piping hot and smothered in a crumbly, terracotta spice mix while bone marrow naan is fragile, floppy and full of luxurious savoury flavour. Nutella naan may sound like the kind of outrageousness you wanna get intimately involved with but malted kulfi proves to be a dreamily light way to end dinner on a sweet note with creamy scoops wildly scattered by a floral garden of pistachio, jaggery & rose. FYI, it’s wickedly delicious when spooned down alongside a Punjabi sour or two; this cinnamon spiked riff on one of the most timeless things to ever emerge from a bar is effortlessly easy to put away. The dining room here at Tandoor seems as though it should be much bigger than it is with the general feeling that because the food is so good, it should warrant a barn of a building to take residence in. Thankfully this isn't the case because too often this sort of spot in lesser hands would end up being twice the size and half the delight. The fact that it feels intimate even during a Friday night when no table remained unclaimed for long is testament to its lovely, homely vibe and the excellent service from a superb small team of staff. No-one rushes you to drink up and move on and, nearly four hours after we arrived hoping for a fragrant, rich & delicious birthday celebration, we rolled out wholly content, slightly Punjabi pickled and utterly in love with this charming slice of India. My favourite out of the lot was the Chickpea chaat and the Dhaal. Everything was really flavoursome and not over the top spicy. I think the only dish I was not a huge fan of was the Paneer and this is a shame as normally the Paneer is great in most places. Would definitely return. Lovely spot to grab dinner and lost the decor and location. From the outside, Tandoor Chop House looks very clean as in style wise, simplicity goes a long way, modern chic design. Upon entering, it has the old colonial Indian style decor. Clean as it is on the outside, large booths on the left and tables and two seater booths on the right. It’s quite wide and spacious. Ordered our drinks which was a mocktail called Pomegrante Fizz – now I don’t know what the hidden after taste was. The first sip went down well, but the second to third, I felt like it was playing games with me! What is that hidden taste?! Some sort of Indian spice, but couldn’t quite put my finger on it! I ordered the Malabar Tiger Prawns and my friend the House Tandoor Chicken. The main menu though sounds mouth watering, especially the Amritsari crispy lamb chops. The food came out within 25 minutes. It was brought out in a small thali which consisted of: Charred Malabar tiger prawns (with shell on) Black Dahl, Tomato and Smashed Kachumber Salad, Green Chutney, 4 pieces of naan, and Halva. The aromas were appetizing, my first taste was the Black dahl, went in for the taste, and honest to god, I tasted a lot of salt, it was swimming in the stuff! I couldn’t really taste any ginger or indian masala, it had barely any garlic in it! Naan you cannot go wrong, I mean its simple science to make and was quite nice. The green chutney is made from green apples, chillies and coriander. It was ok, nothing special. The kachumber salad looked old, the tomatoes had wilted (poor things), it was not fresh. The prawns were hard work, they looked uh-may-zing and once I peeled the shells away, I felt like the flavours had disappeared. I was constantly licking my fingers from the shells where the masala was! Bit disappointing! They were juicy though, and went well with the green chutney! Oh and it needed lemon, a wedge of lemon to squeeze onto the prawns, maybe then it would’ve made the meal! I'd go back for the lamb chops though. Service was swift, and found it relatively easy to book a table online. I'd had a few problems trying to book a table for TCH so we arrived for the time that I thought the table was booked for. Although they didn't have our reservation on the system, we were able to get a table as the restaurant wasn't that busy. TCH is decorated in the British Raj style and is a reasonable size compared to other non-chain restaurants in the area. As there were a few of us we ordered the majority of the main dishes from the menu. We had the house chicken, lamp chops, fish and the paneer from the grill menu. We also had the seekh kebab roll, fried squid and prawns, black daal, cauliflower chaat and some naans for sides/snacks. All the dishes were individually flavoured and each delicately spiced. My favourites were the house chicken and the fried squid and prawns. TCH has a good ambience and the waiting staff are all friendly and helpful. I'd definitely recommend this place for a good meal! 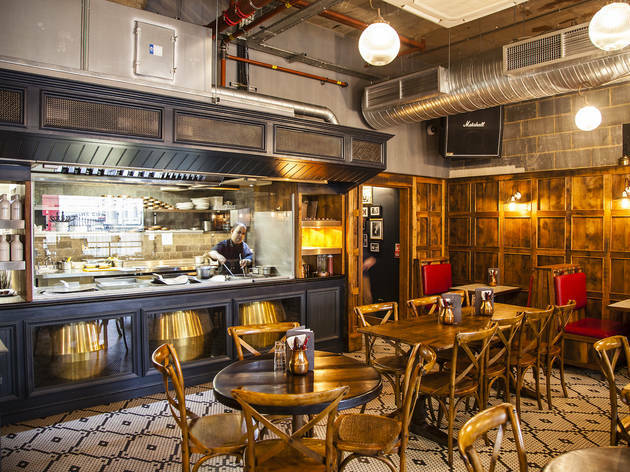 The Tandoor Chop House seems like it's trying to follow in the success of Dishoom. It's got a very similar style and the menu is all about Indian snacks to start, and chargrilled meats and veg for the mains. They take reservations which is convenient and it's in a good location for a meal before a West End show around Charing Cross. Our table for two was squished between the wall and another table to the extent that I had to push myself up out of the booth while also turning sideways in order to manoeuvre myself out. We went for a pre-theatre meal at 6:00 on a Thursday and the restaurant was nearly full when we left at 7:15. I chose paneer for my main which came with a few pieces of red pepper and a dipping sauce but at £11 I thought this was incredibly overpriced. My boyfriend had the chicken which was the cheapest meat main and that was £12. The corn on the cob seemed to lack much flavour and the cauliflower had such a taste of propane (or at least that's what I'm guessing the flavour was) that I could barely eat any of it. The best part of the meal was the garlic cheese naan, but in reality, how hard is that to do. 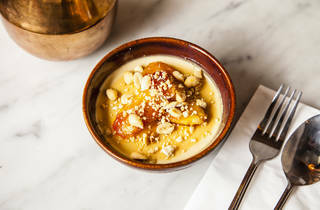 I had the malted kulfi with banana and peanuts for dessert which was nice, but it was so incredibly rich and sweet after a few bites that I couldn't have any more. After seeing so many other good reviews of Tandoor Chop House, I was really looking forward to dinner there, but unfortunately I couldn't see what the praise was about. I came here for a leisurely lunch at this restaurant which is slightly tucked out of the way. Picking from the lunch menu, I opted for the thali with sizeable tiger prawns. It comes with a variety of chutneys and dips as well as a naan. All were really tasty but the dahl was the best one I’ve ever tasted. So creamy and delicious, I’m salivating just thinking about it. 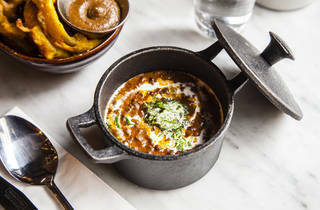 At £14, it’s quite pricey for a lunch that left me with some space still in my belly but I would absolutely go again if only just for the dahl! The service was also really attentive and friendly which always makes it a more pleasant experience. The dining experience is tapas-style, so we got a chance to try a few dishes. I liked that the portion sizes were generous but not overwhelming, so it was perfect to share between the 3 of us. As it was a Sunday night, the restaurant was not very crowded so it was easy to hear each other through our conversations and the small size of the restaurant made it rather cosy. We each ordered a serving of naan; me and my friend went for the Butter Naan while my other friend went for the Garlic, Chili and Cheese Naan. Even though the former is a simple dish, it was done very well. It was served hot, with melted butter on top and tasted really fresh. I liked that the kitchen had a huge window so customers could see the chefs preparing the food. As for the meats, we went for the Tandoor Chicken and the Paneer. Both were lovely but my favourite was definitely the chicken. One serving came with 2 large pieces of chicken cooked in a tandoor and we could really taste the smokiness from the oven. I liked that the edges were chard, making the skin very crispy. The paneer (Indian cottage cheese) was also pretty good, considering it normally tastes quite plain. It was marinated in some lovely spices, which gave it wonderful flavour and was served with a mint sauce. We also shared a side of Gunpowder Fries because I'd heard from a friend that they were a must. True enough, these fries were rather good! They were sprinkled with a mix of spices and chili, which really gave it a kick. The fries themselves were also cut to a good size, soft on the inside and crunchy on the outside. For dessert, we decided to share a Kulfi, which is Indian ice cream. This came in what seemed like a small bowl at first, but after digging into the rich and creamy dessert, we realised it was just the right size. 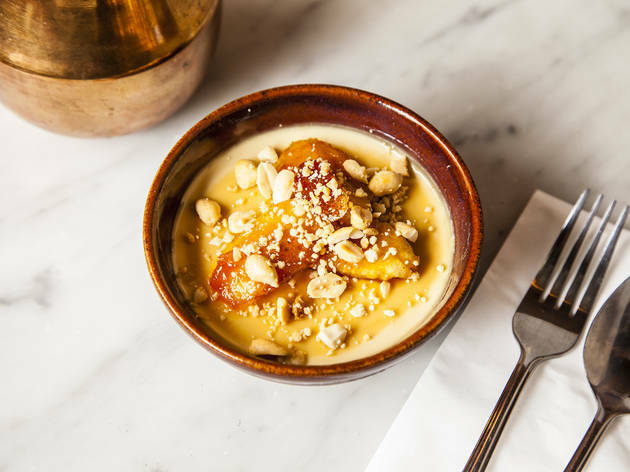 The ice cream came with a slice of caramelised banana and crushed peanuts sprinkled on top, which added a good crunch and texture. Overall, it was a lovely dinner that my friends and I thoroughly enjoyed! I'd definitely come back to try some of their other meat dishes because of how well prepared that Tandoori Chicken was. The naan was equally good and didn't feel too filling at the end of the meal. It was also a decently priced meal for dinner and a great recommendation if you're dining in a group. The staff were absolutely lovely; all friendly and very helpful! As for the atmosphere of the restaurant, I thought it had a great feeling and the ambiance is perfect for an evening meal. Two words: Lamb chops. This place, tucked in a quieter street of Covent Garden has surprised me with the quality of food and service. We went with our server's suggestions of keema naan which is a thin naan topped with minced beef and lamb chops and chicken tandoor as mains, and none of these disappointed. The lamb chops were so delicious that I hoped my friend would forget to eat hers. Overall great experience and a great contender to Dishoom and alike.